I'm settling into week #2 of life on a Mac and I decided it was time to address a feature I was sorely missing: the ability to insert the current timestamp via a simple keystroke. Consider this use-case: within ChangeLog's I'll include the timestamp a patch was released, and while typing 20 or so characters is hardly a deal breaker, it's clearly annoying to have hand enter the current date and time. Surely OS-X had a simple solution for this challenge. Initially, I was psyched to find this automator solution to the very same problem, but I never could get it to work. Finally, at the suggestion of this post I installed and configured TextExpander to do the job. For the 10 minutes I've had this solution in place, I'm liking it. For one thing, TextExpander let's me write shell scripts, which means that I don't need to learn the macro language that comes with it. And for another, the system is text based rather than keyboard short-cut based. So I need only to remember to type 'TS' and the current date will appear, versus trying to recall if I need to hold down Windows + Alt + Shift + T to do the same job. 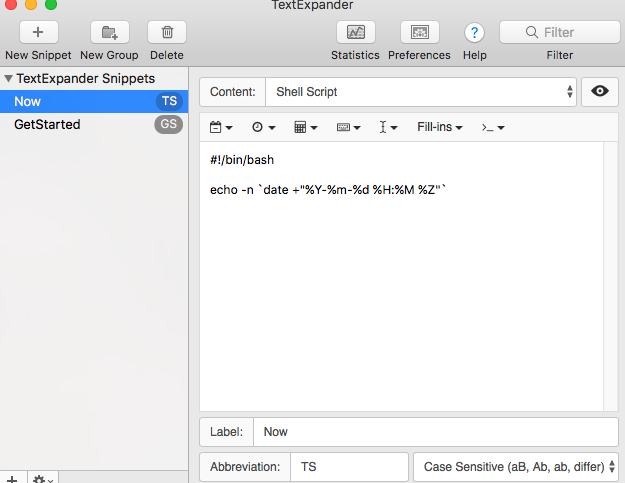 I don't yet have a sense of how TextExpander fits into the larger Mac ecosystem. Is it a utility I can trust and should pay for? Not quite sure yet. Sure, I miss my autohotkey, but I'm going to try to roll with this for now.